Any person with an EXPIRATION date of July 1, 2013 or later will need to affirm that the continuing education requirement has been satisfied. How do I know how many CEU's I need? When do I have to complete the CEU's by? You will receive your renewal form approximately 60 days before your expiration date. It is recommended you complete the required CEU's by this time. You will need to attach a copy of any certificates received showing you completed the required CEU's to your renewal form. Do you have questions about the new requirements to renew your CSL license? This presentation can walk you through what you need to do. Click on the slide above to download. Where can I find a list of courses that have been approved by the BBRS? On the DPS website. Or click on COURSES then click on 'CSL Continuing Education Courses'. Yes. Online courses as well as classroom are available. Check the DPS website by clicking on COURSES then click on 'CSL Continuing Education Courses'. I already attended a course; How do I know if it has been approved? You should have received a certificate of completion with course number listed on certificate. (All courses begin with a CS-xxxx). Check the DPS website by clicking on COURSES then click on 'CSL Continuing Education Courses'. Keep the certificate and return a copy with your CSL renewal form. I already sent my certificate in; do I have to submit another certificate with my renewal form? YES, a copy of your certificate will need to be sent in with your renewal form. I cannot find my certificate; what do I do now? 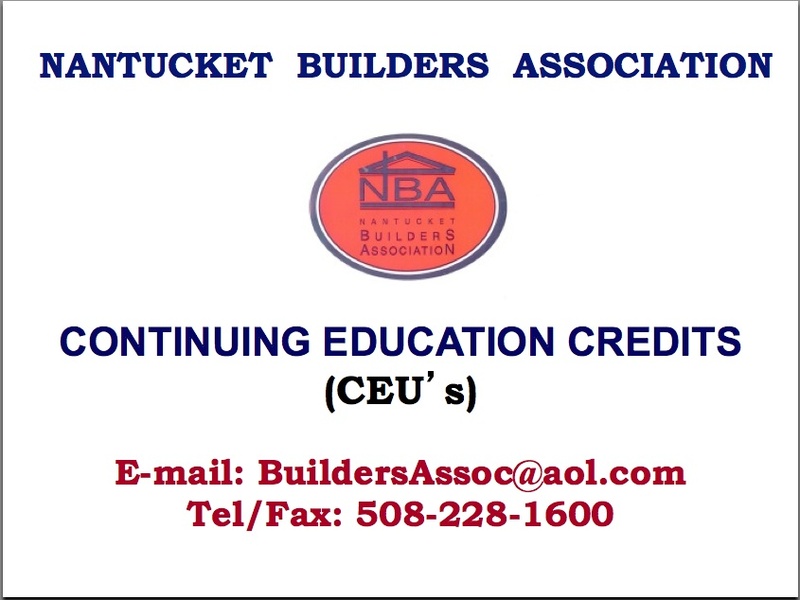 Email ADMIN@NANTUCKETBUILDERSASSOCIATION.ORG or call the instructor to request another certificate. My license does not expire until March 3, 2015 I already completed the required 12 CEU's. Do I have to take the course again? No, this will be accepted when you renew in 2015 because this is the first time you are required to provide the required CEU's. How often do I have to complete the required CEU's? Every two years when you renew your license. Within your two year renewal period. Complete by the time you receive your CSL renewal (60 days before your expiration date). Any additional requirements besides the required CEU's? The maximum number of hours required for any given licensee is 12 hours, regardless of how many categories appear on the license card. A person who is licensed in a specialty category, whether one, two or all six, needs only to achieve the requisite 6 hours of continuing education credit.